Hanan Ashrawi: US Administration joins “fundamentalist Christians and racist white people"
Hanan Ashrawi: US Administration joins "fundamentalist Christians and racist white people"
Fatah officials: Trump is "fascist, Nazi," "ugly racist,"
Trump is "leading a war against the Arab and Islamic nation"
"US and Israel are the only enemies"
"The American administration has joined the extremist Zionists, the fundamentalist Christians, and the racist white people"
"With his [Bolton's] appointment, the matters have been clarified and the picture has been completed - the American administration has joined the extremist Zionists, the fundamentalist Christians, and the racist white people." "[US President Donald] Trump the ugly racist is looking for those similar to him who are most racist, who threaten America's fate even more than they threaten the world's fate. By choosing the despicable John Bolton as national security advisor, he is exacerbating America's crisis and is shooting himself in the foot." "The US only pursues its interests, which are to destroy the Arab region so that Israel - which was planted in the region by colonialism - will rule the region and the Islamic nation will be destroyed. There is a war of the West - I don't want to say a crusade - led today by Trump against the Arab and Islamic nation... 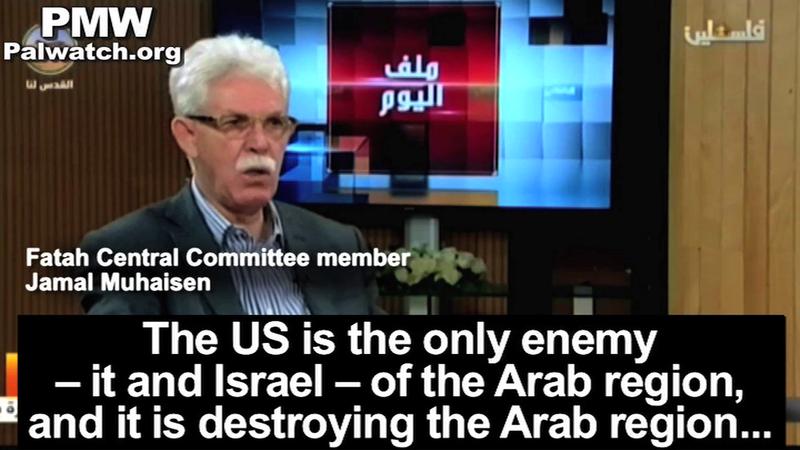 The US is the only enemy - it and Israel - of the Arab region, and it is destroying the Arab region... The only enemy and only danger to the region, to peace in the region and in the world, is Israel and the US." 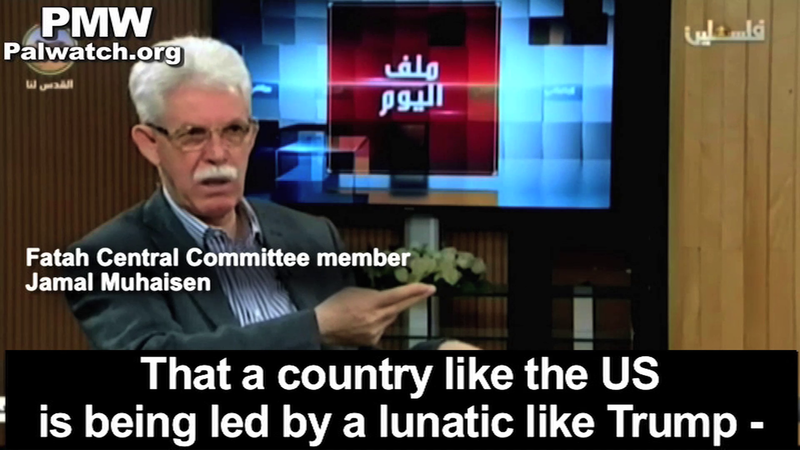 "It was incumbent on Trump - if he wasn't a fascist and Nazi in his thinking - to respond to brother [PA] President Mahmoud Abbas' speech and initiative at the [UN] Security Council by taking back or at least giving a positive interpretation to what he said and the ideas that he proposed... That a country like the US is being led by a lunatic like Trump - I say that this is contempt for the entire American people before it is contempt for the world. Today he is abandoning international law and international legitimacy. He acts confused according to his mood or according to the pressure on him from the Zionist lobby that he is part of, and he brings us a [new] statement every other day." Fatah Movement Central Committee member Abbas Zaki: "Yes, he thinks that all he saw among the Arabs was that they dance and forget themselves. He takes their money and tricks them... He says: 'There is no Iraq. There are rival factions.' Iraq is the second largest oil reserve in the world, estimated at 15 trillion. [And Trump says:] 'It is ours. We will not retreat, it is ours.' If they besiege him and make an arrangement for you, he will say: 'They should pay a trillion - a trillion and a half immediately.' What is this? He is Gestapo. O Allah, expose and reveal this! When your opponent is an ignoramus, by the way, you win." Many other PA and Fatah officials have demonized Trump and US Vice President Pence, slurring them, and have condemned the American decision to recognize Jerusalem as Israel's capital and move the US embassy there. Some have even warned of "disasters of war," if Trump goes ahead with the plans, as Palestinian Media Watch has documented. 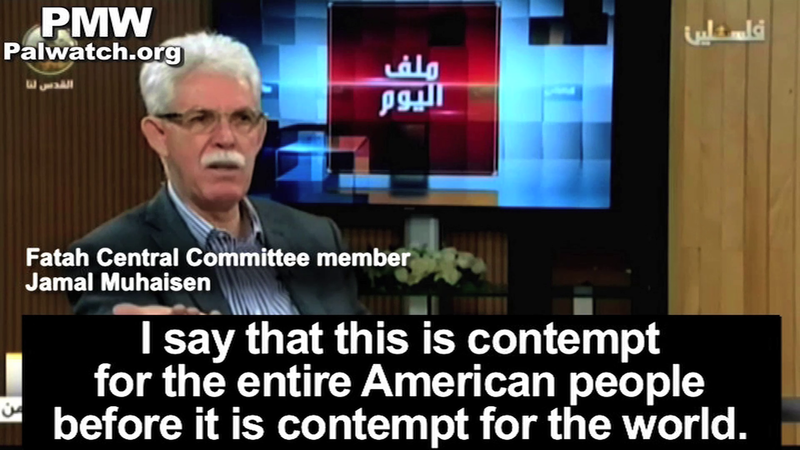 Recently, the PA accused US Ambassador to Israel David Friedman of being an Antisemite. 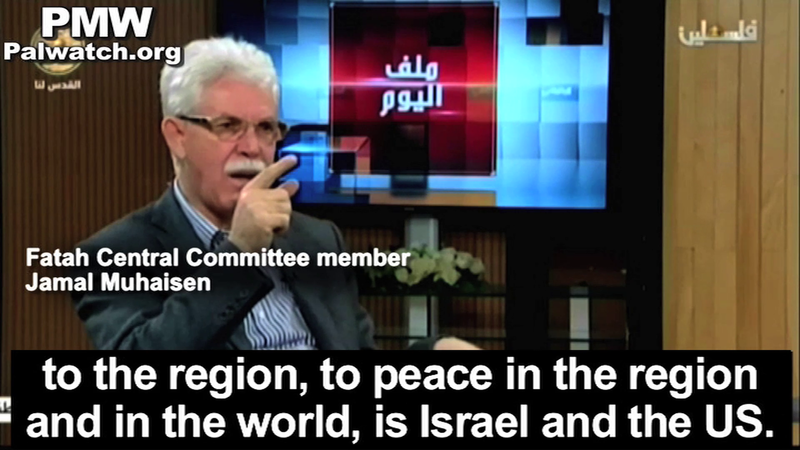 Fatah Central Committee member Jamal Muhaisen: "The US only pursues its interests, which are to destroy the Arab region so that Israel - which was planted in the region by colonialism - will rule the region and the Islamic nation will be destroyed. There is a war of the West - I don't want to say a crusade - led today by Trump against the Arab and Islamic nation... Today the US is attempting to create problems in the region so that we will return to it and ask it for protection. 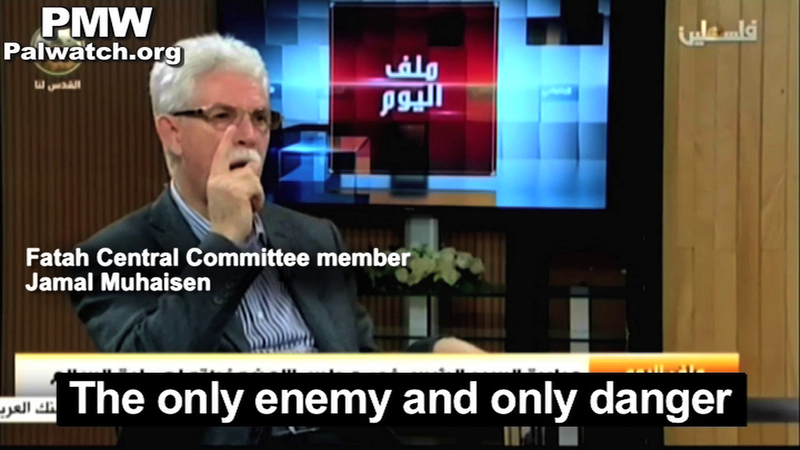 The US is the only enemy - it and Israel - of the Arab region, and it is destroying the Arab region... I say to our Arab nation and to the entire Islamic world - whoever belittles Jerusalem will belittle Mecca and Medina. Therefore, if we are not united, trouble will befall us... The only enemy and only danger to the region, to peace in the region and in the world, is Israel and the US." 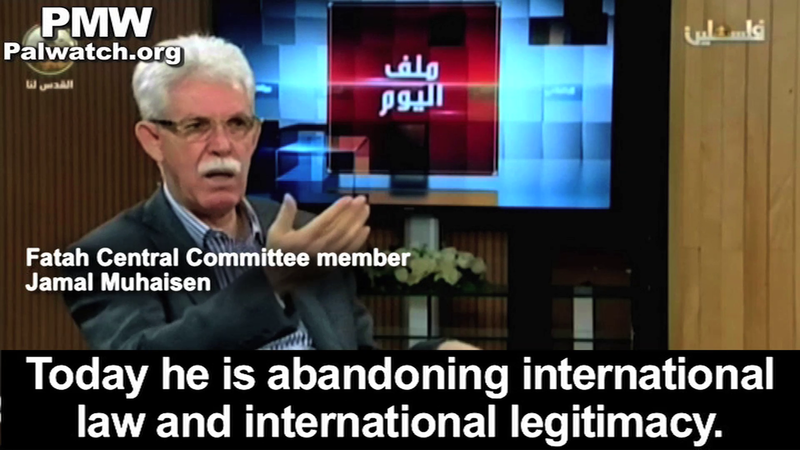 Fatah Central Committee member Jamal Muhaisen: "It was incumbent on Trump - if he wasn't a fascist and Nazi in his thinking - to respond to brother [PA] President Mahmoud Abbas' speech and initiative at the [UN] Security Council by taking back or at least giving a positive interpretation to what he said and the ideas that he proposed... That a country like the US is being led by a lunatic like Trump - I say that this is contempt for the entire American people before it is contempt for the world. Today he is abandoning international law and international legitimacy. He acts confusedly according to his mood or according to the pressure on him from the Zionist lobby that he is part of, and he comes out at us every other day with a statement." Muhaisen claims Trump "is abandoning international law" due to the US State Department's announcement that the US embassy will open in Jerusalem in May 2018. Jamal Muhaisen also holds the following positions: Fatah Commissioner of Mobilization and Organization in the West Bank and PLO Central Council member. US recognition of Jerusalem as capital of Israel - On Dec. 6, 2017, US President Donald Trump formally recognized Jerusalem as Israel's capital and instructed the State Department to begin preparations to transfer the US embassy from Tel Aviv to Jerusalem. Trump added that the final borders of Jerusalem will be determined during negotiations. On Feb. 23, 2018, the US State Department announced that the US embassy will open in Jerusalem on May 14, 2018. The date is the anniversary of Israel's declaration of independence in 1948 according to the Gregorian calendar. Headline: "New American thuggery against Palestine"
The American administration is continuing its aggressive steps against Palestine: The American Congress has conditioned its aid to the PA on stopping payment of the Martyrs' (Shahids) and prisoners' allowances (mukhassasat), while US President Donald Trump has announced the appointment of hardliner John Bolton - who has a long history of hostility towards the Palestinians - as his national security advisor. PLO Executive Committee member Hanan Ashrawi said that Bolton's appointment will toughen the American position and the Israeli position, and will create a 'destructive reality' regarding the Palestinians and the region. Ashrawi said to [the international news agency] AFP: 'This man has a long history of hostility towards Palestine, since he was [the US ambassador] in the UN, where he regularly defended the Israeli immunity.' She added: 'With his appointment, the matters have been clarified and the picture has been completed - the American administration has joined the extremist Zionists, the fundamentalist Christians, and the racist white people.'"